According to the French National Red List, the Mauritian flying fox is an endangered species in France. The Mauritian flying fox, Pteropus niger, a species endemic to the Mascarenes, is the most endangered bat in Reunion Island. Still common at the end of the 17th century, the Mauritian flying fox disappeared from the island between 1772 and 1801, probably due to hunting and the destruction of its habitat due to deforestation, although it still survives in Mauritius. Between 2000 and 2007, a few new observations of the species were made, and a very small population of black Mauritian flying foxes was finally discovered in late 2007 in the eastern region of Reunion Island, confirming the return of the species to the island. This population, however, remains extremely fragile, considering the low number of individuals and the low reproduction rate observed to date on Reunion Island, with just one young observed per year. Cyclones that have affected the islands of the Indian Ocean are one of the factors that may compromise the survival of the species. A single cyclonic episode could lead to a drastic reduction of the population, or even its destruction. Furthermore, the Mauritian flying fox, which stays in colonies in the trees during the day, is vulnerable to any exterior disturbance that may cause it to leave its dormitory. Currently, its main dormitory site on Reunion Island is located in a ravine near a residential area, thus it is exposed to man-made disturbances such as pruning, the creation of paths or clearing. Today, the lack of knowledge on this protected species makes it difficult to implement the appropriate conservation measures. 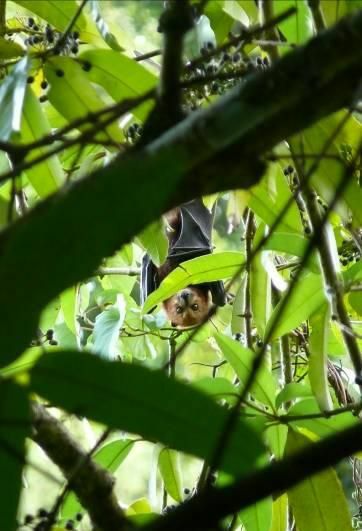 However, the conservation plan for the Mauritian flying fox currently in the works will develop techniques for monitoring the species, with regular monitoring and counting activities, and increasing knowledge on the species. This information will make it possible to identify the best practices to favour the species' sustainable return to the island. Source: IUCN France, MNHN, SEOR, ARDA, Reunion Island Insectarium, GLOBICE &amp; Kélonia (2010). The Red List of Threatened Species in France - First chapters dedicated to the fauna of Reunion Island.